The world has never been as dangerous as it is now. Rogue regimes—governments and groups which eschew diplomatic normality, sponsor terrorism, and proliferate nuclear weapons—challenge the United States around the globe. The American response of first resort is to talk with such rogues, on the theory that, "It never hurts to talk to enemies." Seldom is conventional wisdom so wrong. While it is true that sanctions and military force come at high costs, case studies examining the history of American diplomacy with North Korea, Iran, Iraq, Libya, the Taliban's Afghanistan, and Pakistan demonstrate that problems with both strategies do not make engagement with rogue regimes a cost-free option. Terrorist groups also challenge traditional diplomacy, be they the PLO in the 1970s and 1980s, or Hamas and Hezbollah in the last two decades. Moral equivalency enables, indeed often infuses, the argument in favor of negotiation with terrorists—after all, as many diplomats note, one man's terrorist is another's freedom fighter—but seldom is the record of talking to terrorists considered. While soldiers spend weeks developing lessons learned after every exercise, seldom do diplomats ask why their strategy toward rogues has failed, and whether their basic assumptions about how they conduct such talks might be to blame. In fact, rogue regimes have one thing in common—they pretend to be aggrieved in order to put Western diplomats on the defensive. Whether in Pyongyang, Tehran, or Islamabad, rogue leaders understand that the West rewards bluster with incentives, and that for the State Department, the process of holding talks is often deemed more important than results. "Diplomacy, like any other human activity, has costs as well as benefits. Sadly, too many people believe that diplomacy is cost-free, or fail to understand that merely sitting down together at a negotiating table may simply be shifting the focus of conflict. These are the people who most need to read Dancing with the Devil, but probably won't. The rest of us should." "Because of the current American negotiations with Iran about nuclear weapons, Michael Rubin's path-breaking history, Dancing with the Devil, could not be more timely. 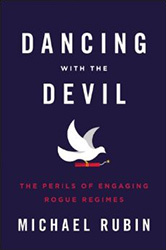 In this illuminating book, Rubin shows how fifty years of dancing with devils by Democratic and Republican administrations has more often than not led to failure rather than success, war instead of peace. Rubin warns us that when America negotiates naïvely with rogue nations and terrorist groups, we pay dearly." "Beautifully written in clean and direct prose, thorough in its history and analysis, and compelling in its clear-eyed recommendations, this book will become the trade and textbook standard for how a free country should deal with hostile states and regimes. Here is due respect for the subtle arts of diplomacy as well as a necessary recognition of its limits." "When and how should the United States engage diplomatically with difficult, dangerous, 'rogue' regimes? No question is more important for America's relations with the world. In Dancing with the Devil, Michael Rubin provides a deeply considered, clearly written, politically controversial, and intellectually compelling answer. This book is a must-read for anyone concerned about the future of American foreign policy." "Rubin's book is one of the most comprehensive histories yet of the risks of US diplomatic engagement with rogue and extremist regimes, and should serve as a warning to naïve policymakers who do not understand their political pathologies." "Everyone who engages or negotiates with rogue states, or any other nation, should be required to read Dancing with the Devil. Rubin's assessment of rogue states is a compelling argument for utilizing all elements of our national power. The North Korea experience alone highlights how diplomacy can just as easily exacerbate as resolve conflict."